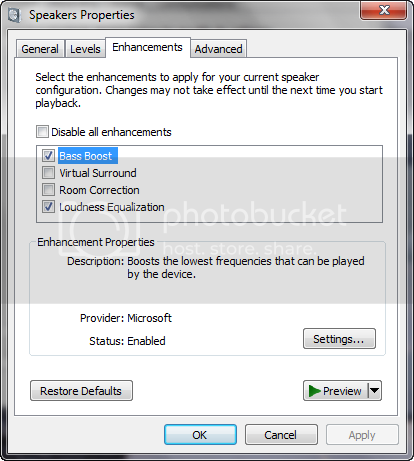 Enhance audio in Windows 7 to improve speaker configuration. If you are facing a problem that your laptop’s speaker (or individual one) is not giving upto the mark sound and you are expecting something hard then this will help you a lot. 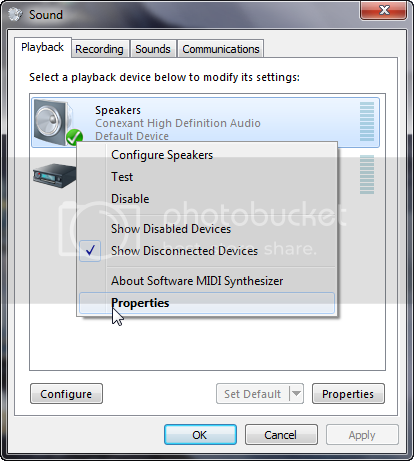 Right click on the volume icon in the System Tray and select Playback devices. Or navigate to Control Panel > Hardware and Sound > Sound. Now in the current tab i.e. Playback, right click on the Speakers and select Properties. Navigate to Enhancements tab and uncheck Disable all enhancement if it is not checked. Now Check the following options: Bass Boost | Loudness Equaization. and you can also check either Virual Surround or Room Correction, only one can be checked once. Now click on Apply and enjoy the enhanced sound coming right from your speakers. Happy Windows Computing !! !